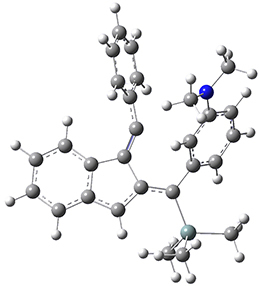 The structure of [2,2]paracyclophane 1 has been somewhat controversial for some time. Early x-ray structures indicated that the molecule was quite symmetric, D2h with the phenyl rings and the ethyl bridges eclipsed. Subsequent low-T experiments suggested a lower symmetry form D2 with a twist that relieves some of the unfavorable eclipsing interactions in the ethano bridges. High-level computations by Grimme1 and then some by myself2 indicated that the D2 structure is the lowest energy conformation, with however a low barrier through the D2h structure. Now, a low temperature x-ray experiment of 1 brings clarity to the situation.4 (The introduction provides a nice summary of the previous 70 year history regarding the structure of 1.) At temperatures below 45 K, 1 is found as a single structure of D2 symmetry (with space group P4n2). The structure is shown in Figure 1. A phase change occurs at about 45 K, and above 60 K the crystal has P42/mnm symmetry. The structure of 1 at the high temperature appears as D2h with somewhat broader thermal motion of the ethano carbons than the phenyl carbons. The low T structure is in excellent accord with the previous theoretical studies, and the phase transition helps bring into accord all of the previous x-ray crystallographic work. Figure 1. X-ray structure at 15K of 1. (1) Grimme, S. "On the Importance of Electron Correlation Effects for the π-π Interactions in Cyclophanes," Chemistry Eur. J. 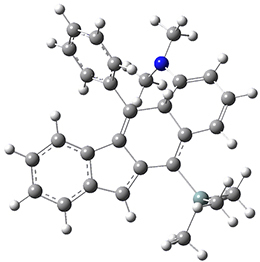 2004, 10, 3423-3429, DOI: 10.1002/chem.200400091. 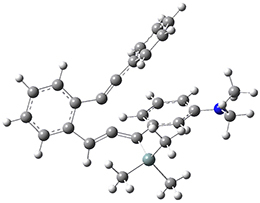 (2) Bachrach, S. M. "DFT Study of [2.2]-, [3.3]-, and [4.4]Paracyclophanes: Strain Energy, Conformations, and Rotational Barriers," J. Phys. Chem. A 2011, 115, 2396-2401, DOI: 10.1021/jp111523u. (3) Dodziuk, H.; Szymański, S.; Jaźwiński, J.; Ostrowski, M.; Demissie, T. B.; Ruud, K.; Kuś, P.; Hopf, H.; Lin, S.-T. "Structure and NMR Spectra of Some [2.2]Paracyclophanes. 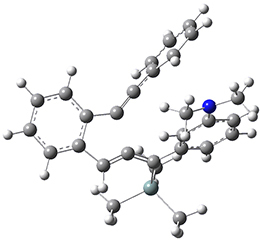 The Dilemma of [2.2]Paracyclophane Symmetry," J. Phys. Chem. A 2011, 115, 10638-10649, DOI: 10.1021/jp205693a. (4) Wolf, H.; Leusser, D.; R. V. Jørgensen, M.; Herbst-Irmer, R.; Chen, Y.-S.; Scheidt, E.-W.; Scherer, W.; Iversen, B. B.; Stalke, D. "Phase Transition of [2,2]-Paracyclophane – An End to an Apparently Endless Story," Chem. Eur. J. 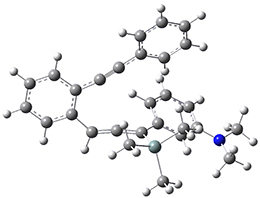 2014, 20, 7048–7053, DOI: 10.1002/chem.201304972. Twistane 1 is a more strained isomer of adamantane 2. The structure of 1 is shown in Figure 1. 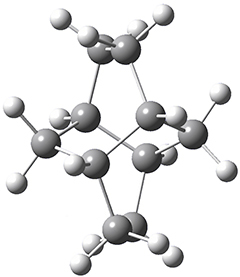 Adamantane is the core structure of diamond, which can be made by appending isobutene groups onto adamantane. In an analogous fashion, twistane can be extended in a linear way by appending ethano groups in a 1,4-bridge. Allen, Schreiner, Trauner and co-workers have examined this “polytwistane” using computational techniques.1 They examined a (CH)236 core fragment of polytwistane, with the dangling valences at the edges filled by appending hydrogens, giving a C236H242 compound. 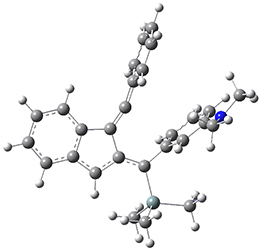 This compound was optimized at B3LYP/6-31G(d) and shown in Figure 2a. (Note that I have zoomed in on the structure, but by activating Jmol – click on the figure – you can view the entire compound.) A fascinating feature of polytwistane is its helical structure, which can be readily seen in Figure 2b. 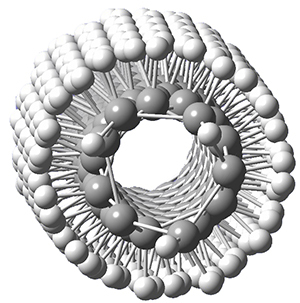 A view down the length of this compound, Figure 2c, displays the opening of this helical cylinder; this is a carbon nanotube with an inner diameter of 2.6 Å. Figure 2. B3LYP/6-31G(d) structure of the C236H242 twistane. (a) A zoomed in look at the structure. This structure links to the Jmol applet allowing interactive viewing of the molecule – you should try this! (b) a side view clearly showing its helical nature. 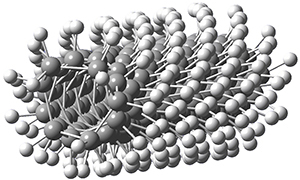 (c) A view down the twistane showing the nanotube structure. 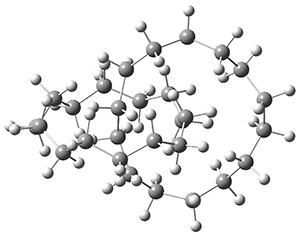 Though the molecule looks quite symmetric, each carbon is involved in three C-C bonds, and each is of slightly different length. The authors go through considerable detail about addressing the symmetry and proper helical coordinates of polytwistane. They also estimate a strain energy of about 1.6 kcal mol-1 per CH unit. This modest strain, they believe, suggests that polytwistanes might be reasonable synthetic targets. (1) Barua, S. R.; Quanz, H.; Olbrich, M.; Schreiner, P. R.; Trauner, D.; Allen, W. D. "Polytwistane," Chem. Eur. J. 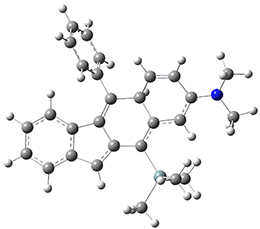 2014, 20, 1638-1645, DOI: 10.1002/chem.201303081. For the Schmittel C2-C6 cyclization taking 1 into 5¸Schmittel has located no concerted transition state, but rather two different transition states 2 and 2’, leading to a common intermediate diradical 3. Then there are two different transition states 4 and 4’ leading to the two regioisomeric products 5 and 5’. 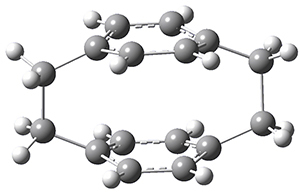 The BLYP/6-31G* structures and relative free energies are shown in Figure 1. Figure 1. BLYP/6-31G*geometries and relative free energies (kcal mol-1) of the critical points along the reaction 1 → 5. If transition state theory (TST) holds here, the rate limiting step is the first set of transition states, and the product distribution should be dictated by the second set of transition states. Since 4’ is lower in energy than 4, TST predicts that 5’ should be the major product. However, the experiments show that the ratio 5:5’ ranges from 1.48 at 30 °C to 1.65 at 60 °C, with the ratio decreasing a bit at higher temperatures still. where XNS is the mole fraction following non-statistical pathways and XS is the fraction following a statistical pathway and Qexp is the experimental mole ratio and Q1 is the partitioning at the first set of TSs and Q2 is the partitioning at the second set of TSs. While this approach is certainly much simpler than performing molecular dynamics, it does require experimental values. According to this model, the above reaction follows non-statistical dynamics about 75% of the time. 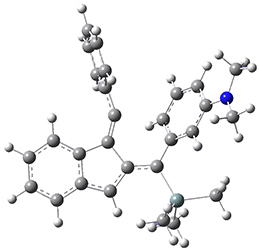 (1) Samanta, D.; Rana, A.; Schmittel, M. "Quantification of Nonstatistical Dynamics in an Intramolecular Diels–Alder Cyclization without Trajectory Computation," J. Org. Chem. 2014, 79, 2368-2376, DOI: 10.1021/jo500035b.